Another month and another guest catfish of the month. 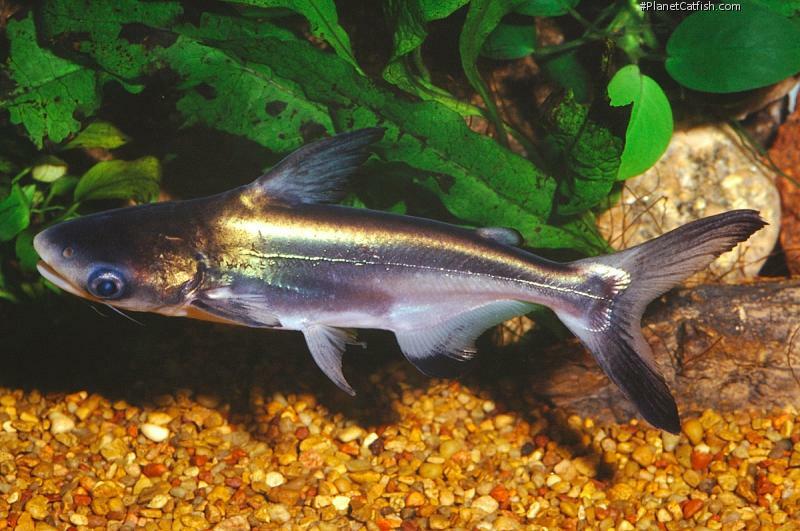 Shane Linder is taking some time off from organizing our "Shane's World" section to introduce this magnificent catfish. Shane takes a different tack with this fish, which is a true giant of Asian waterways, and explains why it isn't one for the home aquarium. P. sanitwongsei was originally described by Smith in 1931, the type locality being Koh Yai, Central Thailand (Siam), also described (in the same publication) at this time was Pangasius beani, type locality being the Lopburi River. 60 years later, Roberts (1991) declared the type for P. beani to actually be a juvenile P. sanitwongsei. Also of interest is that Roberts (1991) was unable to locate the holotype which was listed as stored at the "Siamese Dept. of Fisheries". The holotype could not be found at the Department. This is a food fish and is commonly taken with seines, gill-nets, or hook and line then marketed fresh. Prior to 1997 this fish was rare in the aquarium trade. Those that made it into the trade were usually by-catch of South East Asian shipments. This fish is now farmed in ponds for food and those specimens appearing in the aquarium trade come from fish spawned for aquaculture. The fish's flesh is considered inferior to that of other Pangasiids. This based in part on the feeding habits of the fish. It is reputed to have a fondness for dogs whose floating carcasses are common in the rivers during the wet season. The fish spawns just before the rainy season and the young of the year reach a length of about 10 cm by mid-June. According to an old fisherman (Smith, 1945), the fish does not enter the swamp during the annual inundation, but is instead found in the large rivers near the outlets of the swamp. 250 cm is the largest fish measured, however, according to Smith many people could remember having caught specimens as large as 300 cm. A 3 meter long fish would be a meter thick! P. sanitwongsei of this size have not been seen since the early 1920's. The fish stays in the deepest parts of the largest rivers and thus is rarely caught in the wet season. Warning! Due to the fish's formidable pectoral spines, it is always handled with great care by fishermen. In 1925 a 2.5 meter fish was caught in a cast net above Raheng, Thailand. When the fisherman dived to clear the net the fish inflicted a deep stab wound in the man's side. The man died from the wound. This is most certainly not a fish for any size tank. Not even the largest public aquaria could house these giant, migratory cats. All of the Paroons imported for the aquarium trade will die premature deaths. So spread the word to hobbyists and unknowing retailers alike that this fish should never be ordered or purchased as its maintenance requirements are beyond the dedication of any aquarist. If no one bought them, they would quickly become increasingly infrequently offered for sale. Rainbooth, W. J. "Fishes of the Cambodian Mekong" Food and Agriculture Org. of the UN: 1996. Roberts, T. R. "Systematic Revision of the Asian Catfish Family Pangasiidae with Biological Observations and Descriptions of Three New Species" Proceedings of the Academy of Natural Sciences f Philadelphia," 143: 97- 144, 1991. Smith, H. M. "The Freshwater Fishes of Siam or Thailand" Smithsonian Bulletin 188: 1945.